Blogging is used as a tool for businesses to market their products or services and for blog owners to generate income through advertisements, affiliate products and sponsorships.The one key component to a successful blog is one that is updated frequently with fresh content. This has a created a need for bloggers and hence the wide availability of blog jobs. To find one, you can visit blogs or websites that post blog jobs such as ProBlogger. There are also blog networks that hire bloggers, such as B5 Media. If you need a reliable stream of income right away, stay away from blogging for ad share revenues. These pay you based upon the number of hits your posts receives and based on a percent that your blog post generates. You could only be earning pennies for the whole month in the first six months to a year. Like blogging, freelancers meet the need for a lot of content on the internet. You can also freelance for print and other media offline. 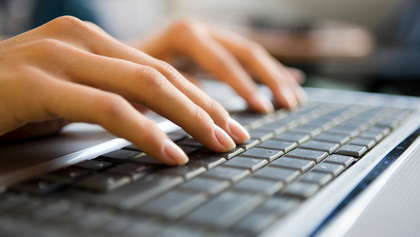 Beginners usually find more look landing freelance writing jobs online first and building up their resume. The tricky part is landing your first one. Many employers will not hire you until you are published. To overcome this, visit websites such as Freelance Writing Gigs and Craigslist to look for writing jobs. Check those websites daily, and apply for a lot of jobs. Eventually, you will get someone to take a chance on you. Once you've landed your first couple of jobs and can provide two or more links to published articles, you'll have a much better shot of landing future writing jobs, both online and offline. There are several national companies that hire customer service representatives who work from home. Your job would be to take incoming calls and assist customers. You would be required to have a dedicated phone line, high speed internet access, and you should be able to type at least 35 words per minute. Many employers prefer to hire you if you have prior call center experience so that they don't have to spend more money or time training you. Your prior skills and experience should also show that you have the ability to ascertain what information or assistance a customer needs over the telephone, and that you're capable of giving it to them. If you need help with any of those skills (and if they're not provided through job training), keep an eye out for classes or seminars at your local community college or library. There might be seminars or classes online through a distance learning program or trade group. If you have experience in bookkeeping or accounting, you can work as an independent contractor or telecommute worker for small businesses. The majority of the jobs center around payroll, accounts receivables and accounts payables. You're required to have expertise using at least one of the major accounting software programs such as Quickbooks or Peachtree. Also, you need to know how to use the Internet and how to communicate effectively using email, because you're working from home. Some accounting jobs involve administrative duties, and therefore require you to be proficient in most Microsoft Office programs, such as Word or Outlook. These software programs can be costly, so be sure to ask whether they're provided to you if hired. Do you have a background in sales? If so, there are many computer work-at-home jobs available for you to put your selling skills to use. For example, you can become an "appointment setter." The company provides a list of potential customers to you, and you make cold calls to the people on that list (trying to get them to set up a phone or in-person appointment). As payment, you receive an hourly rate plus a bonus for any qualified appointments you make. Another example is to sell products you like and use over the telephone. No matter what sales job you choose, try to find jobs that pay you for your work irregardless of whether you make a sale. It's risky to take a sales job that doesn't guarantee you an hourly rate because you may never see a paycheck. Avoid scams by weighing the amount of work required and the hourly rate promised. If it sounds too good to be true, it probably is too good to be true. Also, do not pay to work and do not purchase a business system. There are legitimate opportunities to work from home in sales that don't require any payment from you. There are many computer work-at-home jobs available to you if you have the experience, knowledge and skills required. In addition to those, it's important to assure employers that you will work in a quiet home environment if you're going to work on the telephone. They don't want their customers to know that they're calling someone's home.